Wong (right) and others in a photocall in front of Scare House posters. 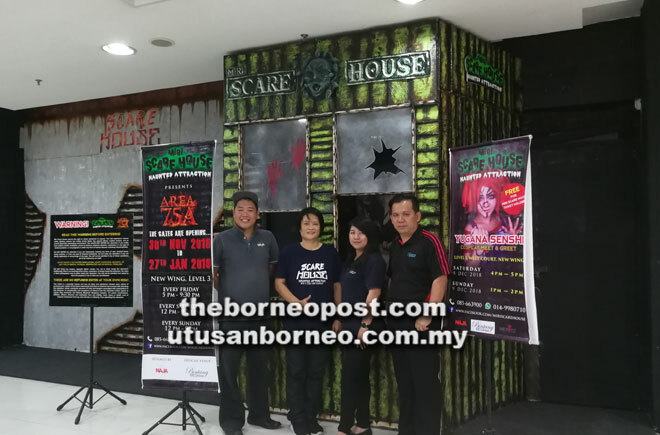 MIRI: Scare House back for the sixth edition is open to the public from now until Jan 27 next year. According to Bintang Megamall’s event manager Allen Wong, more exciting programmes are in store this time. All are welcomed to experience the first and scariest haunted attraction here. The theme is ‘Area 75A’. Scare House is a walk-through attraction that opens every Friday, Saturday and Sunday. On Friday, it opens from 5pm to 9.30pm, Saturday noon to 9.30pm and on Sunday from noon to 9pm. Tickets priced at RM12 per person can be purchased on-the- spot. “Following the success of previous editions, this time, horror fans can expect more chilling surprises, thrills and plot twists. We anticipate more screams and laughter from our visitors,” said Wong in a press statement received yesterday. He added that Scare House is also featuring guest cosplayer Yugana Senshi for a ‘meet and greet session’ on Dec 8 and 9. To be eligible for the meet-and-greet session, just buy an entrance ticket, he added. Yugana, who hails from Kuala Lumpur, is a comic and cosplay page model, international cosplay judge and a frequent guest at South East Asia’s biggest Comic Convention. Her cosplay related work can be found in various interviews and features in international media such as Smoosh website, Cosplay Culture magazine, the Straits Time (Singapore) and Gulf News. Apart from the meet-and-greet session, ticket holders are entitled to a 10 per cent discount for any purchase at YOGU, Coffee Bean, and Tea Leaf outlets at Bintang Megamall. Scare House is managed by Naja Enterprise and Bintang Megamall. It is located at the third floor, west court, new wing of the mall (near Parkson Entrance). For more details, visit its Facebook page at www.facebook.com/miriscarehouse.